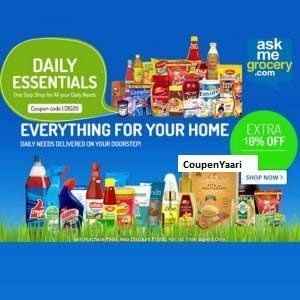 How to get discount on Askmegrocery? Shop for Groceries & get Rs.300 discount on single minimum purchase of Rs.1500. Use Coupon code APPGRO300. Shop for other products & get Rs.300 discount on single minimum purchase of Rs.1200. Use Coupon Code APPGRO300. Terms & conditions: Offer can be availed through above coupon codes only. Two or more coupon codes cannot be used together. Coupon code is applicable for products appearing on landing page only. Limited period Offer, Coupon Code is valid till 30th April 2016.